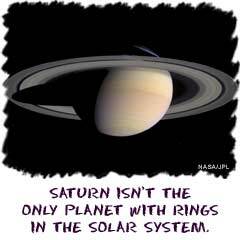 Saturn is the other big planet in our Solar System. You will find its orbit just outside of Jupiter in the sixth position. It is a gaseous planet like Jupiter and those gases give Saturn a very low density. The big astronomy joke is that if you could find a lake big enough and put Saturn in the water, it would float. Its density makes it lighter than water. While knowing Saturn's density is a fun fact, we know that the thing you will remember is that Saturn is the planet with the big rings. While other planets in our Solar System have rings, Saturn's can be seen from Earth. The Cassini spacecraft is studying the moons and rings of Saturn for several years. Saturn is the second largest planet in the Solar System. It's huge compared to Earth. When you think of a day on Earth, it is 24 hours. A day on Saturn is only about 10.7 hours. It is amazing that a planet that has a diameter almost 10 times that of the Earth spins more than two times as fast. The speeds at the equator are staggering. That speed also gives Saturn a bulge at its equator. It is not like a sphere at all. Scientists have also discovered that Saturn is like Jupiter in that it has metallic hydrogen swirling through its atmosphere. Its atmosphere is almost 99% hydrogen. There are also helium and ammonia in small amounts. The ammonia gives Saturn its tan color. Again, like other Jovian planets, Saturn does not have a surface like other planets. Its rocky core is small compared to the ice and hydrogen layers. Only a few probes have made it to Saturn. Pioneer and Voyager I and II all did flybys of the planet and rings. They confirmed a special fact about Saturn and some other Jovian planets. Saturn is self-luminous. Self-luminous means that it gives off more light than it receives. The Sun gives off a certain amount of light and some of it makes it to Saturn. Saturn's composition actually makes it glow, so its brightness is greater than the amount of light it reflects. Currently, the Cassini-Huygens probe is studying Saturn. About six months after the probe's arrival, the Huygens lander was released to study the atmosphere and surface of Saturn's moon Titan. Titan is the only moon in our Solar System that has a measurable atmosphere. As the lander descended, it sampled the atmosphere and discovered rivers of liquid methane on the surface of the planet.